BLOUNTVILLE — Northeast State Community College’s latest building project, the Technical Education Complex, remains the most expensive community college capital project in Tennessee history. But NSCC and Sullivan County Schools officials are looking to the future, beyond completion of the nearly $30 million project in the spring of 2020. That’s because it will be the new home for programs in career technical education for secondary and post-secondary students, as well as for workforce training, replacing the two outdated, original NSCC buildings from the school’s founding in 1966. 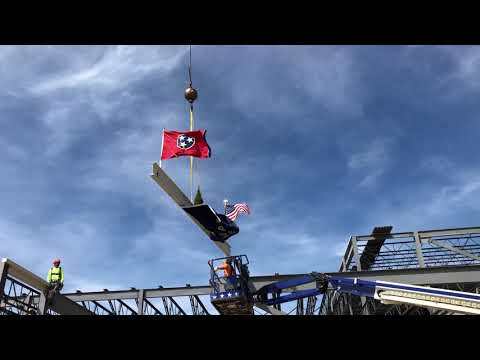 Construction crews Thursday morning placed the final steel beam and set the “topping out” evergreen on the skeletal framework of the $29.8 million project. The school held a ceremonial groundbreaking in October to mark the restart of the project after a delay because of money. WHAT IS THE IMPORTANCE OF THE PROJECT? The college marked its 50th anniversary in 2016. “We’re in conversations with major industries about becoming a training location,” NSCC President Bethany Flora said after she and others put the last few signatures on the beam before a crane hoisted it to be secured at the top of the building. Rowell said NSCC, the only community college in the state with registered U.S. Department of Labor apprenticeship programs, plans to use the facility for collaborative efforts with Sullivan County and other local school systems offering dual enrollment. The county’s new West Ridge High School, to open in the fall of 2021, will be just southwest of the Blountville campus. Sullivan County Director of Schools Evelyn Rafaloski, Career Technical Education Supervisor Aaron Flanary and 9-12 Curriculum Supervisor Brent Palmer also attended the ceremony. Palmer and Flanary said they look forward to working with NSCC. Rafalowski, who wore her own pink hard hat she uses at West Ridge and the under-construction Sullivan East Middle School, is retiring in June after 42 years with the system. WHAT WILL THE STRUCTURE HOLD? The 114,475-square-foot building will house the divisions of Business and Advanced Technologies. The complex will replace the oldest buildings on campus, which were constructed in the 1960s and early 1970s. Ohio-based Messer Construction Co. is the contractor for the project. John Fisher, of Fisher Associates of Greeneville, is the lead architect. The ground floor will house classrooms, lab space and faculty offices for Advanced Technologies. It will have lab space for instruction in computer numeric control (CNC) machining, welding, HVAC/electromechanical, electrical and wiring, magnetics and motors and programmable logic controller (PLC)/mechatronics. Entertainment Technology, part of the Business Technologies division, will also have a lighting and sound lab, recording studios and a sound editing room on the first floor. The top floor will be home to Business Technologies and will feature lab space for business, computer programming, PC maintenance, cyber security, networking, accounting, professional office administration, entertainment technology and an entrepreneurial center, as well as faculty offices and classrooms.